Alan's Factory Outlet is happy to offer a selection of vinyl pergolas. Kits in our inventory are available in several different sizes and are delivered in VA and WV. We offer free delivery on our vinyl pergola kits to Virginia and West Virginia. The do-it-yourself PVC pergola kits at Alan’s Factory Outlet are precut with all of the hardware included for easy assembly. The fasteners, including the lag bolts and screws, are stainless steel. The 6’x6’ posts are made with pressure treated wood and wrapped in white PVC. Our vinyl pergola kits are made with 4 posts. Our PVC pergola kits have a peak height of 8' with headroom clearance of 6' 9". Alan's Factory Outlet vinyl pergola kits are delivered via a tractor-trailer with curb side delivery. Our customers put their pergolas in a many places on their property. Some of our customers buy vinyl pergola kits, so they can enhance the appearance of their gardens. Owners may hang strands of ivy all around their garden pergolas to give them an extra dash of interest. Some owners like to set up a gathering of chairs beneath their pergolas so they can admire the blooming life in their garden. By purchasing one of the vinyl pergola kits from Alan’s Factory Outlet, homeowners can have classic piece of décor in their garden. 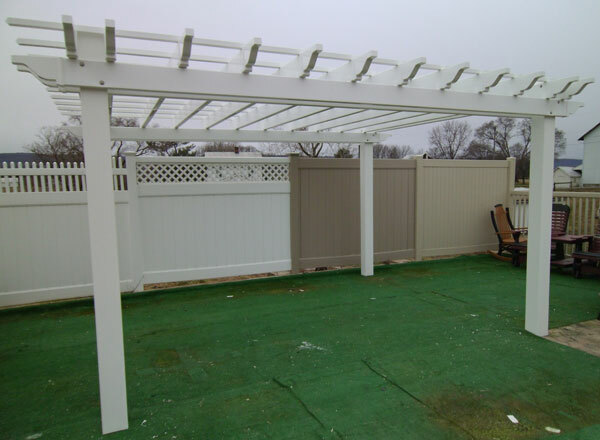 Many of our customers set up their PVC pergola kits in their backyards. Not surprisingly, the classic, attractive design of our pergolas makes them the highlight of many backyards. Some families have a swimming pool in the backyard and want a pergola so they can complete the look of their recreational area. Our PVC pergola kits are sturdy and easy to assemble making them an ideal addition to a backyard. Furthermore, owners can set up a table and a gathering of chairs beneath the pergola so they can sit and watch the swimmers. Vinyl pergola kits are great for homeowners who want a simple structure that will jazz up their backyards! Yards with small fish ponds are ideal places for vinyl pergolas. Kits from Alan’s Factory Outlet are simple to put together and can enhance the serene appearance of a small fish pond. Some people who buy our vinyl pergola kits assemble their pergolas near their fish ponds so they have a place to sit and admire their surroundings. Once again, an owner may want to drape vines of ivy across the rafters of the pergola or even plant some morning glories nearby to add some color. Either way, our PVC pergola kits contribute to the inviting atmosphere around a small fish pond. At Alan’s Factory Outlet, we have an appealing selection for shoppers who want vinyl pergolas. Kits in our inventory are made of reliable, long-lasting material. We are glad to offer our customers well-made, vinyl pergola kits that they can assemble and proudly display in their yards.